Snow globes. Their magic lies in our objective view of their finite and encapsulated world. We have a hard time imagining living inside that tiny world and yet we do it every day when we view this world as the end-all, be-all of life. We are specks on a speck in a speck of the universe. Think of Horton’s Whoville or Orion’s Belt from Men in Black. When we choose to view this inside-the-globe life with outside-the-globe eyes, the pursuits and raging of our fellow globers takes on a whole new light. We see the futility of worldly pursuits and can find peace in the midst of suffering, pain, or persecution. Jesus’ disciples often missed the forest for the trees even though they were blessed witnesses of his presence here on Earth. But in John 6:66-69, for one shining moment, they “got” a small part of the big picture when Jesus challenged them to abandon him as so many had when He raised the bar of discipleship. 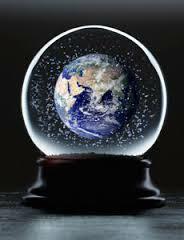 With a view from outside his snow globe, Peter responded, “Where else can we go? You are it.” And so He is. Sorry about the “Take 2” this week. Something was wiggy with my website and the only solution was to delete the original post and re-post it.